The Lakeview School Council runs several fundraisers throughout the year to raise funds for projects to benefit Lakeview students. Please see the Lunch Programs page. FundScrip is an innovative program that lets you earn cash rebates for Lakeview based on things you buy every day like groceries, gas and other household items. A percentage of every gift card you purchase from FundScrip is contributed to Lakeview’s fundraising efforts. To get started, go to the Lakeview FundScrip page and register, using our Invitation Code: W7AB4G. You can order gift cards any time and have them shipped to your home address for $0.85 (plus taxes). Questions? lakeviewpsfundraising@gmail.com. No more lost mittens! Families can order personalized sticker labels for clothing and food containers year round from Mabel’s Labels. If you order from the Mabel’s Labels Lakeview page, Lakeview School Council gets a percentage of each sale. Lakeview Council hosts several family-friendly movie nights throught the school year. Movies are shown in the school gym. Families are invited to come in their comfy PJs and bring their bean bag chairs, blankets, mats or whatever makes them comfortable. Snacks are offered for sale. Everyone is encouraged to bring a refillable water container. Parent volunteers are always welcome to help make these nights a success. Please contact your Council Chair at chair@lakeviewschoolcouncil.ca if you would like to help! Please see the Council Calendar for the next Family Movie Night. 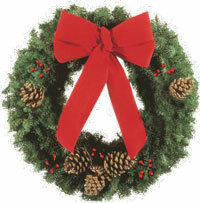 In anticipation of the holiday season, Lakeview students sell fresh Balsam Fir wreaths and centerpieces. They are produced in Nova Scotia and come adorned with velvet bows, pine cones and holly berries. A portion of the sales goes to fund Lakeview programs. Mayfair is a Lakeview tradition that is lots of fun for the whole family and is also our biggest single fundraiser each year. This full day of activities will be held on a Saturday in May, rain or shine, and includes a bike parade, bake sale, plant sale, used book sale, guest entertainers and a talent show featuring Lakeview students. Mayfair cannot happen without the huge support from our Council members and school parents. If you would like to get involved somehow, please contact your Council Chair at chair@lakeviewschoolcouncil.ca. The Mayfair Planning Committee begins its work in late January. Make sure you come and join us! Learn more about this year’s Mayfair plans. If you have questions or feedback on any of our fundraising campaigns, please contact lakeviewpsfundraising@gmail.com.